In the original film that unknowingly launched a franchise, the world's heavyweight champ George “Iceman” Chambers (Ving Rhames) is sent to prison for assault. 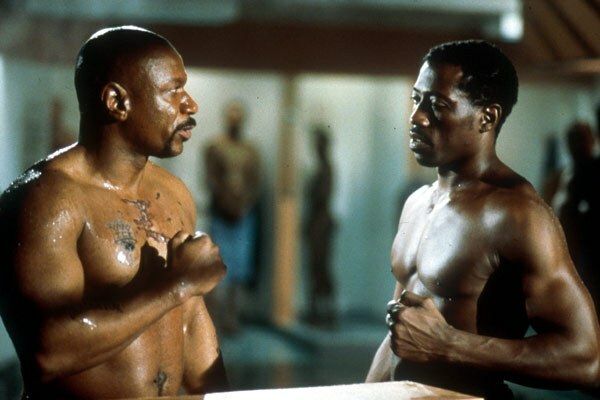 As he adjusts to life inside and learns his finances are being drained by his defence team on the outside, everything points to a showdown with the penitentiary's undefeated champ, Monroe Hutchens (Wesley Snipes). Now with huge gambling odds, mob pressure and the promise of leniency from the parole board hanging in the balance, two champs from different worlds will collide. Impressively written, produced and directed by Walter Hill (the man behind some of my all-time favourite movies including The Warriors), this original chapter is something of an underrated and overlooked gem, a simple but effective straight-up boxing drama. Written off the back of a troublesome production on Supernova, a film that suffered being brutally re-cut, Hill wanted a palate-cleanse and both he and co-writer/co-producer David Giler were inspired by the Mike Tyson-esque story of a famed fighter having run-ins with the law and landing in prison, which they called “the toughest environment in the world”. Reportedly a struggle to get the film financed for many reasons, including the casting of two black stars, Giler even said "there was a lot of pressure to change one of the characters to be white”. Shot on a lean budget and tight shooting schedule for a mainstream film, it earned a modest box office return but interestingly performed much better on video, a market that was utilised again for the sequels. A strong, well-acted, well shot boxing movie by any standard, it’s biggest legacy is still perhaps the door it opened for what was to come. Set some years after fighting Monroe Hutchens in prison, former champ "Iceman" Chambers (now played by Michael Jai White) visits the Russian Federation for a series of boxing matches where he is framed for drug possession and once again finds himself in prison. There, he discovers an illegal fight tournament orchestrated by prison officials, aided by the mob, and dominated by their notorious prison champ Yuri Boyka (Scott Adkins), a deeply religious, honourable yet tough-as-nails fighter. A second showdown for Iceman’s freedom is inevitable, but not before he gets to grips with another set of skills to survive a new style of combat. Helmed by martial arts movie legend Isaac Florentine, with action design by J.J. Perry (Haywire, Warrior), arguably one of the best choreographers in the world, Undisputed II became a hit on the video market, immediately hailed as being better than the original (very unusual for a straight-to-DVD release), all largely due to the impeccable fight scenes, all cleanly shot and edited, and the amazing physical skill showcased by its actors. Simply put, it was a “must see” if you were a fight fan, a benchmark proving indie action really delivers the goods more than the Hollywood counterparts. Also worth noting is how stylishly the film is shot and continues Florentine’s career-spanning homage to spaghetti westerns through a range of shot choices and character quirks. Taking centre stage, Yuri Boyka is severely hobbled and psychologically scarred following the injury he suffered at the hands of the “Iceman”. What’s more, he’s no longer the feared prison fighter he once was and is reduced to cleaning toilets. But when a new prison tournament begins, matching the best fighters from different prisons and luring them in with the promise of freedom for the winner, Boyka finds a new purpose. Now, he must re-discover the fighter and champion in him and fight for his freedom. Kicking things off, one of the most interesting aspects about part III is the idea of taking the antagonist of part II and making him this chapter’s protagonist, or more accurately our anti-hero. He has also become more rounded, humane and has been humbled by his defeat. Quite frankly, in a tournament of psychos (Chilean star Marko Zaror plays a crazed villain), we can’t help but root for our underdog. Helmed once again by Florentine with a fresh take on the action by another well-known choreographer, Larnell Stovall (Altered Carbon, Falcon Rising, Universal Soldier: Day of Reckoning), the fighting intensity is cranked into overdrive with longer, more frequent fights and a wider showcase of fighting styles from an impressive and varied roster of opponents. The ambition of the action is extreme and it pays off in full. Boyka must not only fight back from a weaker place, but his competition is now far more fierce. Enjoying his new found freedom, Boyka is pursuing a dream to become a legitimate fighting champion on the outside in real sporting venues. He also remains devoted to his faith and spirituality, donating to his church. When he suddenly and accidentally kills an opponent in the ring, struggling with guilt, he tries apologising to his opponent’s wife and learns that she’s inherited a debt to the mob since her husband’s death. With a new purpose and setting out to right his wrongs, Boyka re-enters the illegal fight world to save the widow, and ultimately himself. This time crediting Todor Chapkanov as taking the reigns, with Isaac Florentine listed as producer, the tone and visual style continues from previous entries and transports our anti-hero into new terrain, both literally (in the outside world with casinos, gangsters and guns) and emotionally, with a more guilt-ridden, tormented side than we’ve seen from him before. For the first time ever, he is exactly where he wants to be, free, but is hurled back into a world he left behind and all for someone else. If you consider the evolution of this character over the last three films, it’s pretty impressive, both in script and performance. Continuing the trend of gravity-defying, world class physical action showcased throughout this whole franchise, choreo duties are taken on by Tim Man (Accident Man, Triple Threat, Ninja: Shadow of a Tear). He does a very impressive job of balancing both Boyka’s athletic style and finding new creative ways to dispatch foes, while incorporating fresh environments and the skills of new adversaries, namely flamboyant local champ Kazmir (Brahim Achabbakhe) and the terrifying Koshmar, played by 6’8” actor, bodybuilder and mass-monster, Martyn Ford. Finding inventive ways to keep the Boyka journey going is surely a challenge, but the way this story has evolved beyond the ring is very impressive and adds an unusual depth to the fight film. Martial arts cinema hits a new peak with this one and I can’t wait to see how the story evolves next, and hopefully it will. Fuelled by the aforementioned talent, both in front and behind the camera, creating an almost mythical lead character and escalating set of challenges fans can truly get behind, the Undisputed saga is a showcase for what modern martial arts cinema is capable of achieving and has set a genuine benchmark for real physical action cinema. Undisputed: Fight For Freedom is out now on UK digital download and on DVD 4th February from Lionsgate. For more insight into the popularity of the Yuri Boyka character, check out this tribute video from Talk N Review with contributions from myself and many others.